October is Breast Cancer Awareness Month and statistics show that about 1 in 8 U.S. women will develop invasive breast cancer over the course of her lifetime. In D.C., breast cancer is the second most commonly diagnosed cancer, with Ward 8 having the highest incidence. Regrettably, for longtime S.E. community member and mom, Donita Caldwell, these statistics weren’t just numbers; they were real people with real connections to her life. With seven aunts having already succumbed to this terrible disease, and a mom currently battling, Donita understood both the risk and urgency to learn more about her own breast health. But Donita had enough on her health plate, including a diagnosis and management of a chronic disease, diabetes. Even at its worst, she never felt alone in her efforts to become and stay well, thanks to the care and support of her local health center, Conway Health and Resource Center. In 2013, Donita chose Community of Hope as her “health home” because of their dedicated providers and their friendly and familiar approach. With COH’s support, she felt she had the courage to take on almost any challenge that could come her way. She had no idea that her next challenge would hit so close to home. In 2015, due to her family’s history of breast cancer, Donita was referred to get a mammogram at a facility that her insurance company shared “would be within walking distance of her house.” To her surprise, the appointment address was the same as where she had been receiving medical care. She quickly learned that this one Atlantic St. location, only blocks away, not only housed her medical home, but also an organization that would perform her mammogram and soon become a second home -Breast Care for Washington. As one of Community of Hope’s anchor partners, Breast Care for Washington’s (BCW) mission is to reduce breast cancer mortality in the Washington, DC area by promoting access to breast cancer screening, diagnostics, and treatment to all women regardless of their ability to pay. 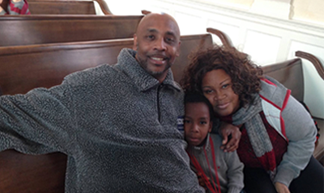 Donita felt an extra dose of comfort when she came to get her mammogram and walked through Community of Hope’s doors. She was hoping for the same friendly and familiar encounter s that made this place feel so welcoming and safe; and that’s just what she got. 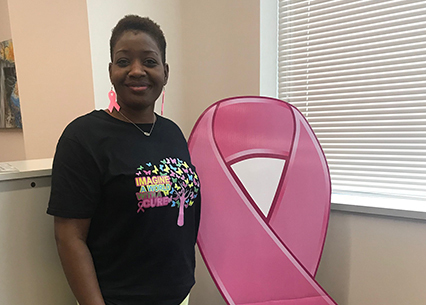 BCW’s staff patiently helped Donita face her fears by dispelling common misconceptions and successfully performing her mammogram exam. Soon after, she received a letter in the mail that indicated she needed additional testing because a lump was found in one of her breasts. Donita became such a familiar face at Conway Health and Resource Center that she was encouraged to apply for a position within BCW. Now, as BCW’s Outreach Specialist, Donita has the distinct responsibility and pleasure of spreading her story and awareness about breast care to thousands of women and men across the District. She is always most excited to do so in her own neighborhood, Ward 8.